Stephanie recently joined Ipswich Veterinary Centre as our diagnostic radiographer. She joins us from the human medical profession where she worked in one of the country’s busiest accident and emergency departments. 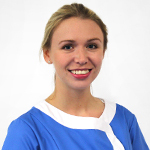 Stephanie is extremely experienced in performing CT scans, x-rays and interventional angiography. She has a great love of animals, hence her recent move into the veterinary profession. Outside of work, Stephanie has three horses that she loves to ride and take care of.